We are interested in causes of ecosystem dynamics and consequences of environmental change for foodweb interactions and ecosystem functions. Our research methods combine field surveys, experiments at multiple scales and analysis of long-term observational data. We work in lakes and marine systems (seas, estuaries and coastal systems), in temperate and tropical locations. In the world’s largest ecosystem, marine plankton form complex trophic interaction networks that are influenced by environmental conditions. A major challenge is to predict how shifts in community composition at the base of marine food webs affect higher trophic levels and ecosystem functioning. Variation in the spatiotemporal availability of food resources is a critical determinant in shaping biotic interactions, and consequently energy pathways from primary producers to consumers. Zooplankton have a key role for carbon and nutritional flux from primary producers to fish and for biogeochemical cycles in marine food webs. The purpose of this project is to investigate zooplankton feeding preferences and hereby their function as intermediates between primary producers and fish communities, through in situ identification of dietary uptake using novel DNA barcoding. This information will be used to predict how changes in the composition of communities due to natural and human-induced disturbances affect population dynamics and food web stability, important attributes to ecosystem functions. This project is connected to a VR project. Local populations can respond to changes in abiotic and biotic condictions via adaptive evolution, provided that there is genetic diversity for relevant traits at the population level. This process has led to intra-specific functional diversity that is believed to be an important component of maintaining food-web functions and ensuring ecosystem resilience under pressure. However, knowledge on both the physiological tolerance and capacity of individual populations to respond to climate change is at best scarce for the vast majority of Baltic species. The aim of this project is to investigate the adaptation potential of Eurytemora affinis to environmental conditions influenced by climate change, such as temperature and salinity in the BalticSea. This species occurs in many estuarine water bodies throughout the northern hemisphere and is an important prey species for commercial fish. Different populations across the Baltic Sea are cultured in common environments in the lab and population specific adaptations to temperature and salinity are investigated. This project is funded by BONUS and FORMAS. Benthic-pelagic coupling substantially affects material cycles, population dynamics, and fisheries yield particularly in shallow coastal-estuarine ecosystems. Large fractions of net primary production sink to the seafloor, providing food for key components of the benthic food webs. The soft-sediment seafloor is a major environment for organic matter mineralization, source of nutrients and an evolutionary seed bank for the water column species community, many of which have benthic resting stages. To date, however, the pelagic and benthic food webs are mainly studied as separate compartments, and ecosystem models do not sufficiently include the benthic-pelagic coupling processes. The purpose of this project is to investigate how energy flows are coupled between the open water (pelagic) and sediment (benthic) food webs using the Baltic Sea as a model system. We disentangle how shifts in pelagic and benthic species composition may affect the flux of organic matter and essential nutrients to better understand benthic and pelagic food-web dynamics. This project aims to provide novel inputs to better understand organic matter transfer and consequently factors determining plankton benthic food web processes. This project is funded by FORMAS. In the Baltic Sea top predators such as seals have an important impact in pelagic fish populations. In places where there is also a commercial interest for these fish species the interaction between seals and fisheries has been shown to be significant. The seals in the Baltic Sea eat mainly the same pelagic fish species and are of similar sizes as those taken by the fishing industry (e.g. adult herring, sprat and cod). Thus, given that Baltic Sea seal populations have grown continuously since the middle of the 1980s, the seals’ dietary habits may have a major impact on the local availability of fish. The aim of this project is to estimate the magnitude and uncertainty of seal prey consumption compared to fish catches in order to assess potential resource competition between seals and fisheries. We use ecosystem models developed with the EwE software and integrate the data of seal trophic dynamics, energy flow, prey biomass and commercial catches in order to describe the food-web and assess interactions between lower and upper trophic levels based to different seal population scenarios, and to what extent the predator-fishery interactions modulate the system and impact onto each others dynamics. This project is funded by BONUS and FORMAS. Human societies are dependent on ecosystem services for the provision of natural resources, and especially so in poorer developing areas. In coastal East Africa, a sustainable ecosystem production of fish is essential for food security and sustaining human livelihood. Here, the aquatic vegetation in coastal seas, including extensive seagrass beds and mangroves, are a coupled social-ecological system providing critical nursery habitat and spawning grounds for new generations of commercially and societal valuable fish. However, these essential nursery habitats are under threat due to human activities and lost at an accelerating rate. A key question is how an increasing degradation of essential coastal habitats limits the production and dispersal of fish larvae, a critical bottleneck for sustainable fish stocks. The aim of this project is to conduct field surveys to relate fish larvae production to seagrass habitat status in coastal Kenya and Tanzania. This project is connected to a MASMA project. Effects of plankton community structure on energy pathways and trophic efficiency – The goal of this project is to test the overall prediction that phytoplankton community structure and species composition are key regulators of energy and food quality transfer to mesozooplankton. We will (i) test the stability of compound-specific d13C isotope between the phytoplankton-zooplankton interface, which will be an important requirement as biomarker for trophic interactions, and (ii) manipulate natural microbial species composition and bacterial activity in mesocosms and measure carbon and nutritional transfer efficiency to zooplankton. This research is funded by a grant from the German Science Foundation. Trophic efficiency in plankton food webs – A current challenge to ecologists is to predict how compositional shifts at the base of the aquatic food web propagate up to higher trophic levels. Energy or resource availability for upper trophic levels is governed by food-chain length and by factors that regulate the rate of energy transfer from primary producers to consumers. The conceptual ideas are however based on limited empirical data and few studies have tested these concepts at ecosystem level. This project will be integrated within larger-scale experimental study and will concentrate mainly on the role of microzooplankton for structuring plankton communities. This research is supported by a grant from the EU Marie-Curie IRG. Effects of ocean acidification of foodweb interactions – Atmospheric loading of CO2 from anthropogenic sources has raised increasing concern about the combined effects of rising ocean temperatures and ocean acidification (OA) on marine biological processes. Our present understanding of these impacts on marine organisms is almost entirely limited to single species responses, while consequences for food web interactions are still unknown. The variety of diverse species responses might prevent extrapolation to the community and ecosystem level, because biotic interactions might lead to a dampening or amplification of single species effects. We use small-scale laboratory experiments and participate in large mesocosm experiments to investigate effects of OA on energy transfer from primary producers to terminal zooplankton consumers. We investigate the cycling of organic matter using natural biomarkers the biochemical composition of phytoplankton as an index of seston food quality. 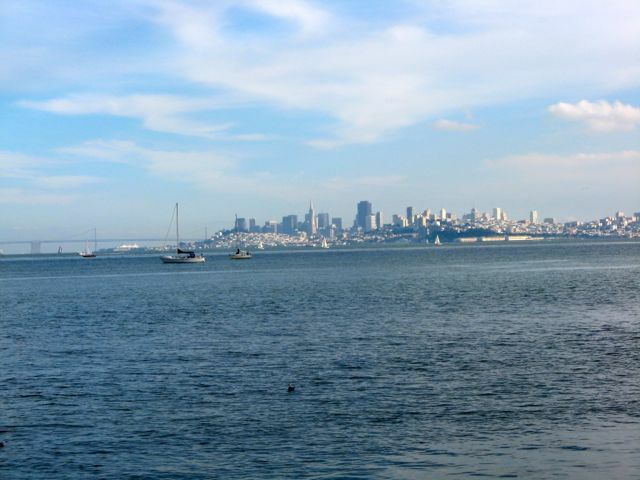 Nutritional quality of zooplankton as prey for fish in the San Francisco Estuary – Previous analysis showed that the zooplankton community in the San Francisco Estuary was shaped by large spatial and temporal changes in both abundances and species composition that affected quantity of zooplankton carbon. It is expected that taxonomic shifts affected quality of zooplankton carbon for fish due to altering biomass transfer at the base of the food web that can profoundly influence nutritional quality and population dynamics at higher trophic levels. The proposed research aims to measure essential nutritional status for zooplankton taxa and will calculate food-quality indices for fish. On the basis of nutritional plankton and biomass values, spatial patterns as well as long-term and recent changes in plankton quality associated with compositional shifts will be estimated. This research is funded by a grant from the Delta Science Program, California.